Despite its recent growth, breadth and unique attributes, there is no single text covering the discipline of fish neuroendocrinology. In fact, other than a few mammalian neuroendocrinology textbooks, there is a serious lack of texts in comparative neuroendocrinology. Currently, information on the anatomical organization and function of the various neuroendocrine systems in fish is only available in original research papers and reviews. 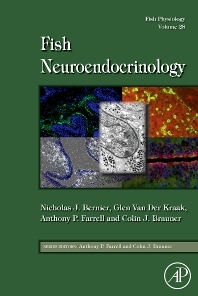 By providing a current and comprehensive volume that highlights the specific properties of fish neuroendocrinology, this book will go beyond being the only reference text for fish neuroendocrinologists and will also serve comparative physiologists, endocrinologists, neuroanatomists and behaviourists interested in understanding the reciprocal actions between the nervous and endocrine systems. Tony Farrell is a graduate of Bath University, where he was fortunate to study with Peter Lutz. His fortunes grew further when he moved in 1974 to Canada and the Zoology Department at the University of British Columbia to complete his Ph.D. degree under the superb tutelage of Dave Randall. In 2004, Tony returned to UBC when he accepted an endowed research chair in Sustainable Aquaculture. In between these positions at UBC, Tony was employed at the University of Southern California (PDF), the University of New Brunswick (sessional lecturer), Mount Allison University (first real job) and Simon Fraser University (moving through the ranks to a full professor). In addition to highly controlled laboratory experiments on fish cardiorespiratory physiology, Tony is committed to working on animals in their own environment. Therefore, his research on fish physiology has taken him on an Alpha Helix expedition to the Amazon, the University of Gothenburg and the Kristineberg Marine Research Station in Sweden, the Portobello Marine Biological Station in New Zealand, the University of Christchurch and Massey University in New Zealand, the Bamfield Marine Science Station and the Huntsman Marine Station in Canada, the University of Aarhus in Denmark, the University of Adelaide Charles and Darwin University in Australia, and to the Danish Arctic Marine Station on Disco Island in Greenland. These travels have allowed him to work and with many superb collaborators word-wide, as well as study the physiology of over 70 different species of fish. Tony has received a number of awards for his scientific contributions: an honorary degree from the University of Gothenburg in Sweden; Awards of Excellence from the American Fisheries Society for Fish Physiology, Conservation and Management; the Fry Medal from the Canadian Society of Zoologists; and the Beverton Medal from the Fisheries Society of the British Isles. The primary goal of his research program is to investigate environmental adaptations (both mechanistic and evolutionary) in relation to gas-exchange, acid-base balance and ion regulation in fish, integrating responses from the molecular, cellular and organismal level. The ultimate goal is to understand how evolutionary pressures have shaped physiological systems among vertebrates and to determine the degree to which physiological systems can adapt/acclimate to natural and anthropogenic environmental changes. This information is crucial for basic biology and understanding the diversity of biological systems, but much of his research conducted to date can also be applied to issues of aquaculture, toxicology and water quality criteria development, as well as fisheries management.